I’ll be the first to admit that some people just don’t like to exercise. They know they need to move and they know that exercise is good for them, but they just really struggle to get the momentum going. What to do if you’re a non-exerciser? If you have never exercised or just don’t like to, you need to start somewhere, and there’s no better “beginner” exercise than walking. 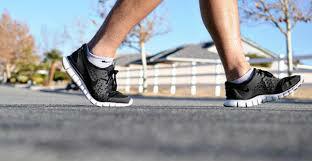 Start by walking at a comfortable speed until you have more stamina and can go a bit faster. It doesn’t matter if it takes you an hour to go one mile. If this is all you can do then you are further ahead than someone who does nothing. Eventually you’ll be going two miles in that length of time, progressively improving. The benefits of walking are many. Walking is considered low impact on your joints; it relaxes you. It does not secrete high cortisol hormones like high impact exercises do, which is great news if your hormones are not balanced. 1) Make sure you get great shoes. This is not the time to buy the Walmart on-sale sneakers. You’ll end up paying more for it in terms of leg- or foot-pain. 2) Start out in comfortable weather. So if you hate the heat and you live in Miami, noon is probably not the time to be going for a 3-mile walk. 3) Listen to music you like, or podcasts while you are walking. Pray or meditate. Make a list in your head of all the things you are grateful for during your walk. Whatever you choose, it will make the time go faster. 4) Don’t be in a hurry. Pick a time where you can really enjoy yourself and take in all the details of the beautiful outdoors (or indoors if you so choose). 5) Walk every day. Don’t skip a day for any reason. Before you know it, walking will become so easy that you may want to venture out and try something else when it comes to exercise. But even if not, you’ll now have a great form of exercise to help reduce stress, drop a few pounds, feel and sleep better.